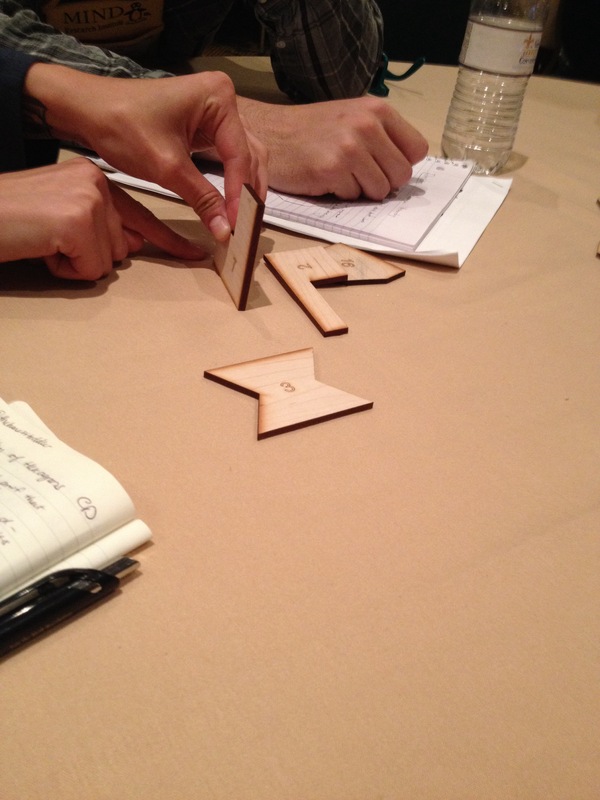 Those most mathematical fun I had at NCTMNOLA was in sessions focused on Elementary School level math. Either by accident or by impulse I found myself drifting into sessions that one would associate with K-5. Well, if that’s the case, why did I have so much fun? David and Kathryn led us through a gallery walk of sorts of mathematical games for K-2 Common Core standards. Immediately, selfishly, I and Alyssa began trying to adapt them for our contexts. Maybe we should have been more in the moment, and maybe that’s our High School education brains kicking in, where everything is a nail to our math hammer, but manipulatives and games by and large don’t happen at the high school level. A few months ago I had some non-math teachers do a little card matching game with functions and she remarked that she had just assumed that these manipulatives activities were for the kids in Talented and Gifted. It’s understandable where one would get that impression. Anyway, David and Kathryn were great hosts and provided several activities in a relatively short amount of time. Marilyn Burns is as exceptional in person as you’ve come to know from her books and websites. Her presentation focused largely on her wealth of experience with math talks, presenting video of various methods kids use to mentally solve 99+17. Every time a kid solved 99+17 in a different way my heart fluttered a little bit. This looked like so. much. fun. After watching a few of these videos I wish my entire job was to ask kids how to solve 99+17 all day. As soon as I arrived on my home doorstep I asked Mrs. Emergentmath and emergent kids #1 and #2 to solve 99+17. Why did I feel like this was revolutionary? Why was this so much fun? Was it because these kids were practicing invaluable Algebra skills they will need later in school? That’s probably part of it. 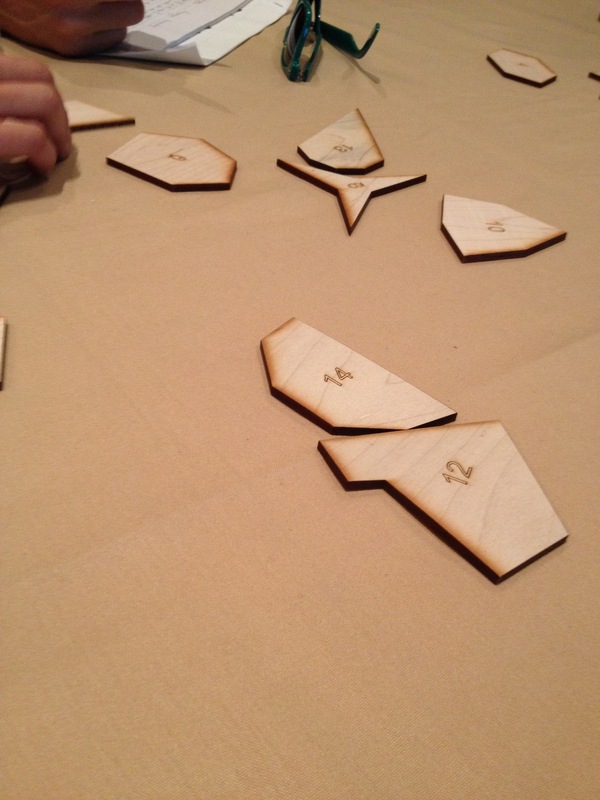 It also hearkened back to the idea, first presented to me by Bryan Meyer, of Mathematical Play. Dang, there’s that word again: play. And speaking of Mathematical Play, perhaps the most fun I had in any single session was Christopher’s Hierarchy of Hexagons. Double points for an 8am start time. Christopher began by having us mentally sorting four different visual polygons into two groups (we hadn’t gotten to the hexagons just yet). Some people chose to sort the regular polygons from the irregular, others chose to sort by reflective properties. Either way, it gave us a good bit of practice until the real fun began. ENTER THE HEXAGONS. We chose a hexagon that, in Christopher’s words, “spoke to [us].” I chose the one that kinda looked like a fox, or the FiveThirtyEight logo. Brandon had no clue whatsoever. Anyway, once we chose our hexagon, Christopher asked some participants to describe the hexagon they chose, why, and then led us through some authentic definition-making, that makes the hexagon belong (or not belong) to a category. Participants’ definitive categories included “waffle cones”, “reflectors”, “utah’s”, and more. From there, we created a flow chart/Venn diagrammy thing that showed which hexagons belonged to which categories and which were mutually exclusive. We’ve all done this with quadrilaterals (“a square is a rhombus, but a rhombus isn’t necessarily a square”). But hexagons are (as it turns out) an Undiscovered Country of polygons. It was fun and rewarding to explore those uncharted waters for a while. Here are half of those hexagons. Explore. Play. I remember playing. I remember learning new things by conjecture, trial and error, sketches, etc. Why was I having so much fun in these sessions that weren’t in my self-defined “wheelhouse?” Did I miss my calling? Should I have been an elementary school teacher? Probably not, but it was fun to occupy that space for a while. After volunteering in my daughter’s 3rd grade class for a year, and after these sessions, I’m more convinced than ever that we need to blur the lines between elementary and secondary math education. There’s no reason I couldn’t have done the Hierarchy of Hexagons in my Geometry class. There’s no reason I couldn’t have started off with a number talk in Algebra 2 once a week. If only for the fun of it. Those lines can be blurred, and there’s so much to be gained by doing so. Teaching math classes from the 5th through 12th grades at the same time was a really formative experience for me. When you’re teaching factoring of whole numbers, polynomials, and Gaussian integers all at the same time, the common themes, structures, and practices—so much that’s important—come to the forefront. 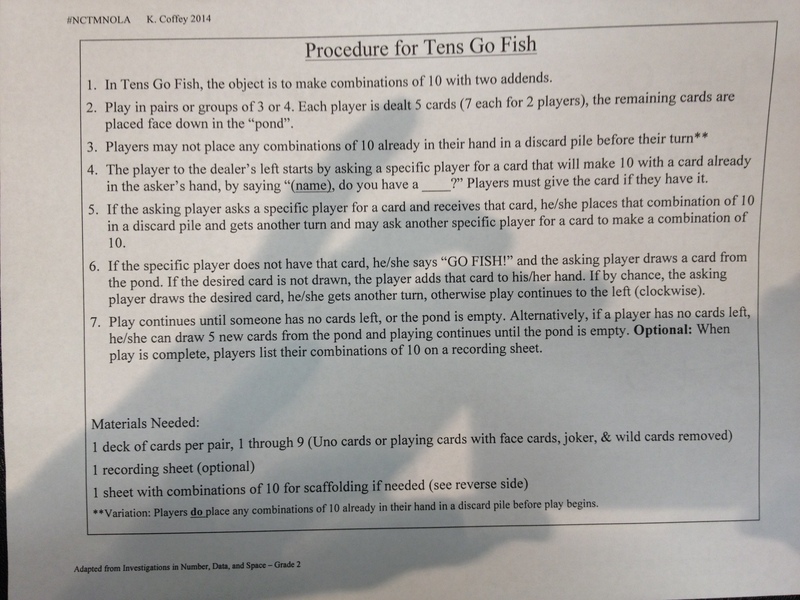 More teachers should have this kind of opportunity to cross-pollinate their mathematical understandings. Thanks for all these recaps and reflections, Geoff. And it was great getting to meet and hang out with you in NOLA!